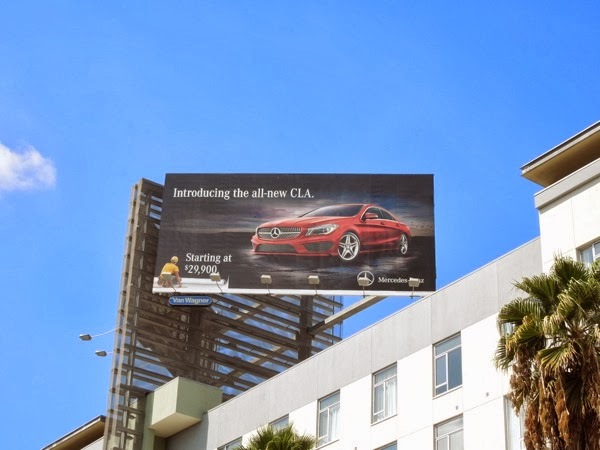 Now this is more like it car companies, doing something a tad more engaging with your out-of-home advertising rather than simply showing your latest model of car. 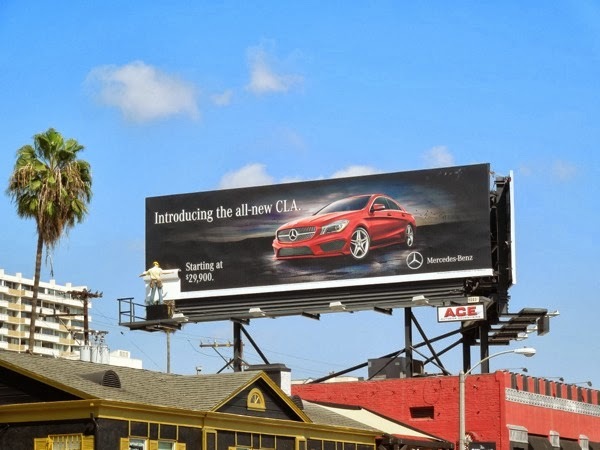 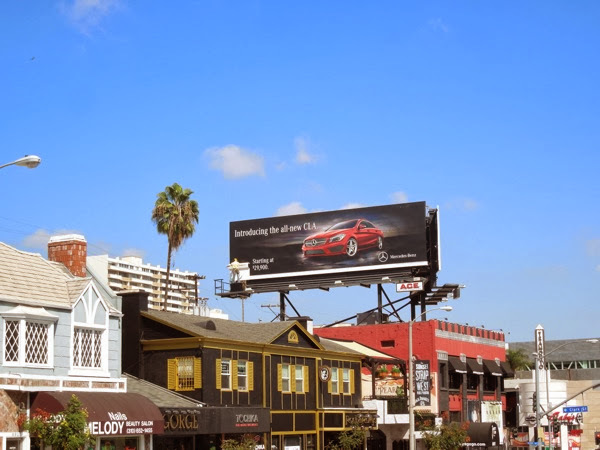 This collection of billboards for Mercedes-Benz all-new CLA car is a great example of an integrated campaign as it builds on elements of the TV commercial featuring Willem Dafoe as the devil, where the actor tempts someone to sign their life away for their dream car and lifestyle, but then realising that 'starting at $29,900', this dream is more than affordable without selling his soul. 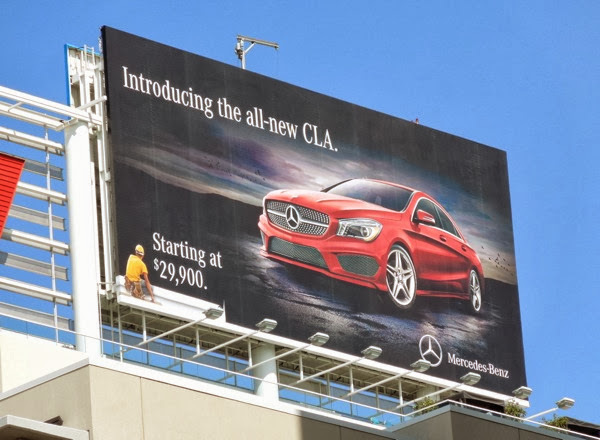 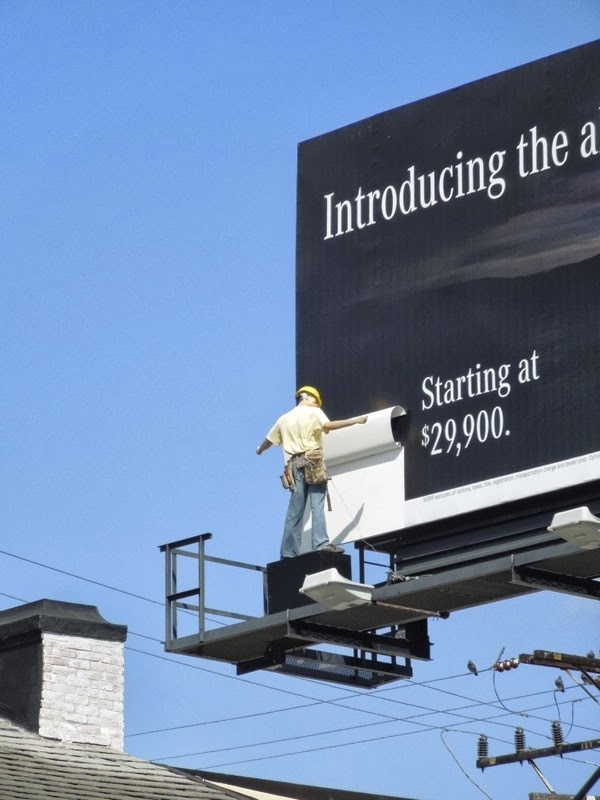 The commercial features workmen installing a billboard for the new CLA model and ends with them revealing the price, so it's a nice device to have the workmen replicated on the ad creatives in 2D, and also 3D, helping to draw your attention to the price point. 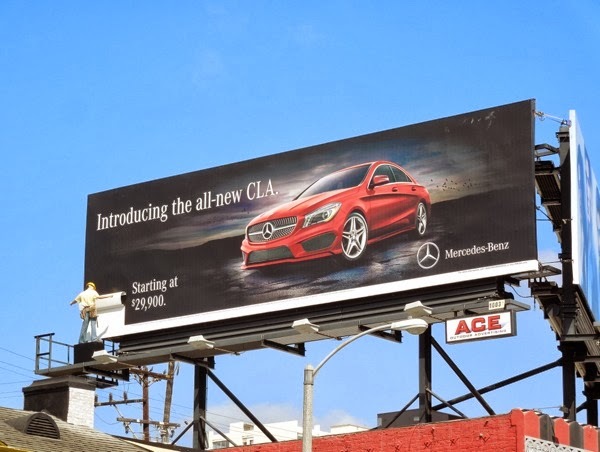 It's not that we haven't seen mannequins used before on special installations like this one to grab passersby attention, but what does make it stand out and is more unexpected, is that it's for a premium car company like Mercedes-Benz and not an entertainment company or theme park attraction who employ these clever gimmicks on a far more regular basis. 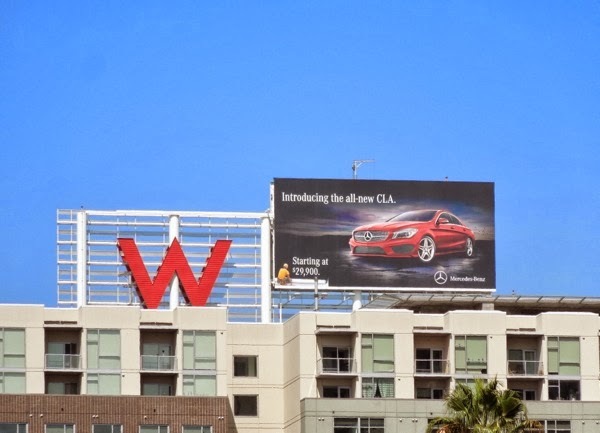 This special 3D mannequin installation was spied along the busy commuter corridor of Sunset Boulevard in West Hollywood on September 25, 2013 with lots of opportunity to be seen, whilst the standard billboard ads (which look far more striking with a red car, rather than the black one featured in the commercial) were spied near Sunset & Vine in Hollywood the same day. 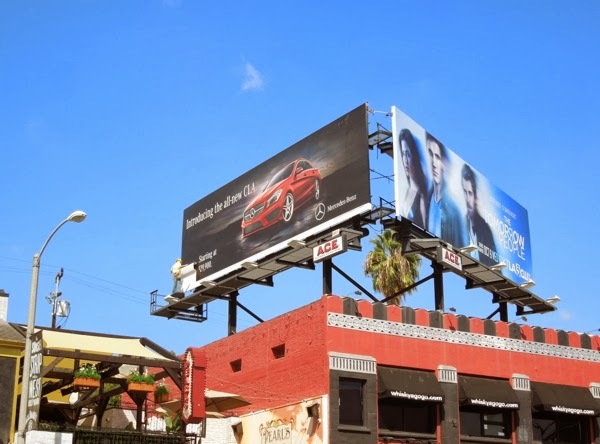 Daily Billboard would probably suggest one improvement to the location of the special installation though and have it located on the right-hand side of Sunset Strip, so that the mannequin was even more noticeable and not so hidden away when you're driving along the road. 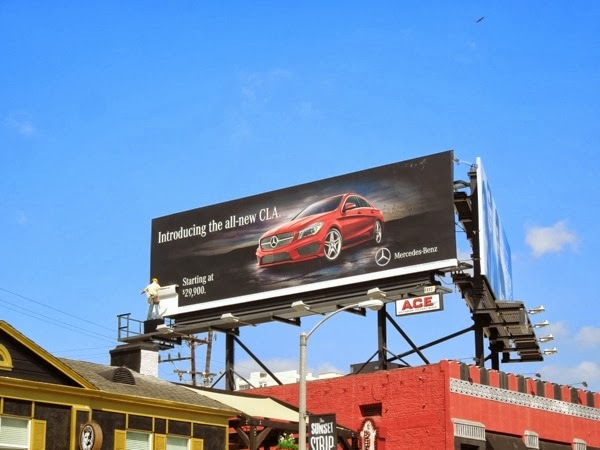 If you like this idea, be sure to check out even more car-themed advertising here at Daily Billboard.